Yesterday, I gave Eli a few breathing treatments with a nebulizer, and he was SO much better by yesterday evening. I didn't hear a single cough through the night, and he seemed great when he woke up this morning, so he went to school today. I'm so relieved! Usually, when he gets sick, it lasts a long time. It was ridiculously cold outside today. I decided to run on the treadmill, not because of the cold, but because I wanted to be home in case I got a call from the school about Eli, and had to leave right away. I got on the treadmill and turned on a thriller/horror movie on Netflix called Amber Alert, and somehow got sucked into it. It was corny, but it kept me interested. I felt kind of tired while I ran today. I used my foot pod, so that I would have an accurate pace. I had another good day on Simply Filling. For lunch, I planned to have a salad with turkey and feta, and a bowl of tomato and roasted red pepper soup. Once I got my salad prepared, I noticed that the soup wasn't considered a "Power Food", because it was a bisque. So all I ate was the salad, and I knew I'd be starving within an hour. Jerry and I did a little more Christmas shopping, so I got a decaf latte from Panera to hold me over. But I was SO hungry by the time we got home at 2:30. I should have made a sandwich or something to go with the salad. When I got home, I had cottage cheese with peaches, which was really good! I swear these pictures aren't blurry until I put them in the collage! So weird. Everything was Simply Filling except for the wine, which was 4 PP. I'll probably end up having an orange or apple tonight, too. Every time we ask the kids what they want for Christmas, they both reply that their number one item is a gerbil. When they first asked, I just blew it off, thinking that they'd soon forget and come up with something else. But they kept asking. I had gerbils while I was growing up, and I have a fondness for them; so Jerry and I decided to go ahead and get them each one for Christmas. A year ago today, I reached my goal weight of 133. Even though I'd gotten down to that weight in late 2010, my goal at that time was 126, so I never "technically" reached goal. I changed my goal weight to 133, and last December, I reached my goal weight for the first time in my life. Today, I'd been hoping I would write a post about how far I've come over the past year in maintenance. I hoped I'd get it all figured out, and I would be binge-free, and I would be skipping through maintenance with a big ol' smile on my face. But I'm not there yet. I still have hopes of getting to that point some day, but this past year has been very similar to before... always working on maintenance, having lots of ups and down, struggles and successes. I continue to learn about myself every time I screw up, and I always continue to keep working on figuring out "effortless" maintenance (who knows if that even exists?). Today, I weighed in nearly 10 pounds over my goal weight, at 142.5. I'd kept my weight pretty steady all year until Halloween, and it's been tough this fall. I was stressing out about facing the number, but instead of giving up, I made a new plan (which was to give the Simply Filling technique a try). I'm afraid of getting "too far gone", when 5 pounds turns to 10 pounds which turns to 50, and before I know it, I'll have gained back all the weight. So, even though my weight is higher than I'd like it to be a year out from reaching goal, I am still pretty damn proud that I've kept off 110+ pounds for so long. 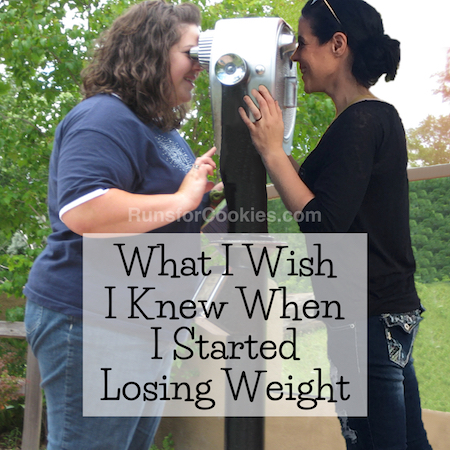 The odds were stacked against me from the moment I started to lose weight, but I was determined to beat them. While I can't write that I've done a terrific job this year in maintenance, I can write that I learned a lot about myself, what works (and doesn't work) for me, and I really do feel this year was a success! I'm going to have to take a closer look at power foods. I was surprised that the fat free feta cheese is a power food! I was at a meeting yesterday and they are introducing the new things for next year. The program is the same but there is a new thing called "Simply Start" which is a booklet of meals that fit the simply filling plan. If you have e-tools you can download it. They are giving the book to new members but present members don't get it until the last week of the year. I downloaded it but haven't had a chance to look at it yet. I think you have done a great job at maintaining! I've learned so much from you. I don't think effortless maintenance exists! It's always going to be there. I know how you feel with that "too far gone" point. I think the key is to always get right back on track after a slip up. How are you going to keep two gerbils hidden?? Yes, I was surprised by some of the things on the Power Foods list. A lot of the things that I eat already are on the list, so making the switch to Simply Filling really wasn't that hard (so far). I really like it! You've done a terrific job! You're part of the GOOD statistic and are a constant source of inspiration for so many people, including myself. I love your blog and I'm so happy I found it. Everything you write is so down-to-earth and relatable. Congratulations on everything you've achieved! You're one of the reasons I've decided to give WW another (and hopefully FINAL) try. Believe me, I know it's hard at times to see yourself accurately. But Katie! You really are doing very well at maintenance. I don't know if food/exercise/health is ever truly effortless- I've been maintaining my loss of 20+ lbs for over 22 years (with 2 pregnancies thrown in there) and I'm still learning and growing and figuring things out. There will always be ups and downs. Staying on the journey toward health and making adjustments as needed is what it's all about. Thanks for sharing your experiences with all of us; you are such an inspiration! Thanks for your insight! It's scary to think that I may still be struggling in 20 years, but I'm assuming that it'll get easier over time. Congrats on your maintenance! Cool Christmas gift! I always had pet mice growing up, so sorta the same thing. They are lots of fun! You've done amazing! I'm 12 lbs from my goal weight and I'm trying to figure out what maintenance looks like too. Thanks for your daily insight into your day to day, it helps me so much! Well done Katie, you should be proud, you've come SO far! I've never reached goal but I also have the same idea that once I reach goal, I'll become this slim person who somehow manages to maintain that slimness with minimal effort - basically maintenance Nirvana :) But maybe that's not the case? Maybe like with everything else in life, if you work hard for it, you have to work hard to maintain it? Relationships, Careers, Businesses ... we don't work hard to get those things and think the rest will be easy, we know it will be a learning process, fully of trial and error and ups and downs so it makes sense that maintenance is exactly the same. "If you work hard for it, you have to work hard to maintain it..." I love that! It makes a lot of sense when put that way, particularly when you compare it with relationships, careers, etc. You've done a fantastic job! The more we learn about ourselves, the better we can get at handling the ups and downs? I concur w Vickii,you are a huge success and you being so honest here, helps me be honest and also, that the struggle is 'normal' and I am not some kind of food freak. Good job!! It has definitely been a learning experience! I feel like I know myself so much better now than I did in the beginning, and I'm still learning every day. I love gerbils!! I always had them as a kid!! With out details let me just suggest if you didn't already get the clips for the screen top of the cage. They are a pain to get off but.....cats. Lets just say I still have one horrific memory of my cat Max and my gerbil when I was in 3rd grade and since I am now 40 and still remember it like it was yesterday. I, too, have a bad memory from when I was a kid that involves my cat and a gerbil! I'm going to have to be extra cautious, because I'd hate for anything to happen. Don't be so hard on yourself for not being 'perfect'! You are amazing! What is 'perfect' anyway? You are healthy and active. That is success! Thank you! That seems so obvious, but I never really thought of it like that. 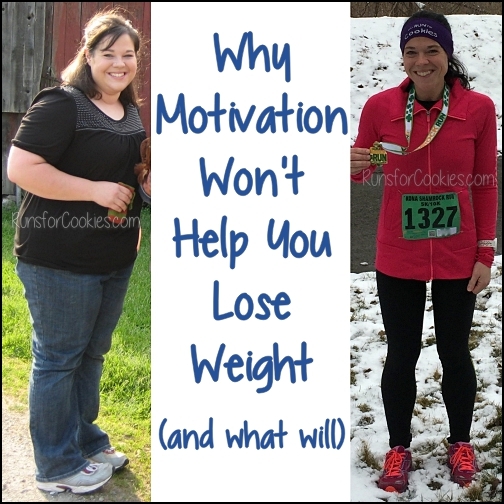 I'm healthy and active, which is exactly what I was striving for when I started losing weight. Therefore, I succeeded! Now you.... are AMAZING. You have KEPT off over 100 + pounds... YOU are the only person I know (kind of) that has and continues to do this. Yes, it's work everyday..... and struggles often. Thank you for being you... struggles and all .... you inspire thousands ! I know the feeling very well; I lost weight more than a few times in my life, and gained it all right back, before ever reaching goal. It's amazing how EASY it is for the pounds to come back on! Katie--Let me know when you get this maintenance thing figured out. You know we are already in a very small minority, keeping the biggest percentage of our weight off for over two years. I reached my goal of 160 (I set my goals LOW and made the number HIGH) on April 15, 2011. Since that time I have gotten down as low as 139 in Oct. 2011, and then back up to almost 170 recently. But I put the skids on it, like you say, you don't want 10 or 20 pounds to become 40 or 50 because that leads to ALL the weight coming back on. So now I'm back down to 161.8, and hoping to see the 150's pop up again sometime soon. I've been having some serious stomach cramps related I think to some female problems (I have been to so many doctors trying to figure this all out--including a colonoscopy yesterday--it was normal! ), but the cramps sure have helped with trying to eat less. I also fill up very quickly and if I overeat the cramps are even worse. Good incentive--Pain!! The gerbils will be fun. We now have a cat to go along with our Bulldog pup. She appeared at our house this Fall, and since we fed her, she didn't leave. When it got cold I couldn't bear to leave her outside, so in the house she came. She still spends a lot of time outside, but is the sweetest cat I think I ever had. Very friendly, loves to be held, petted and purrs all the time. Sometimes I tell her, "I always wanted a cat like you, and then you just showed up at my door." The dog also thinks she is a living "chew toy," but they do okay together. Looks like you're doing well with your Simply Filling plan. 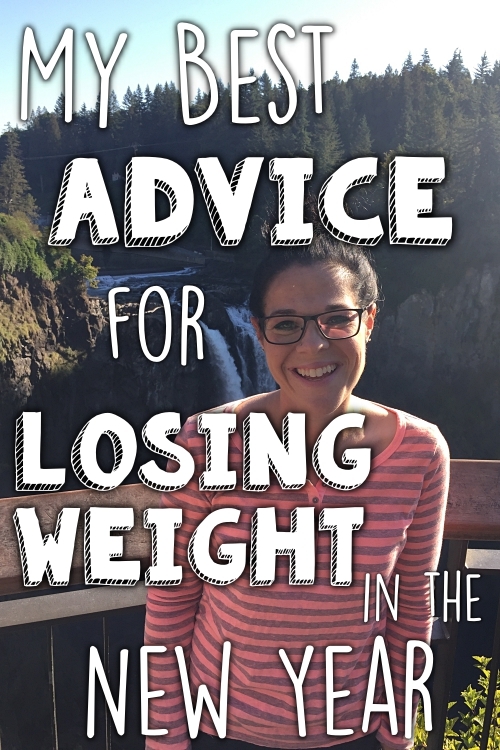 I highly recommend that losing weight plan over constant stomach cramps. I hope you feel better, Pam! That sounds awful. 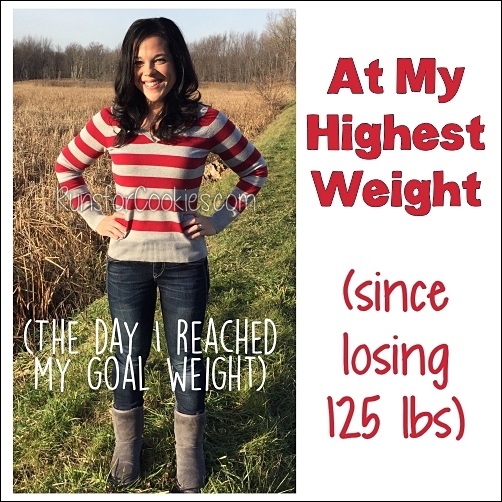 I am a new follower and I am so inspired by your weight loss!!! I am a fellow runner as well. I have ran 2 half's and I have signed up to run my first full in April!! EEK!!!!! i just hope I can cross the finishline running and not on a stretcher!! 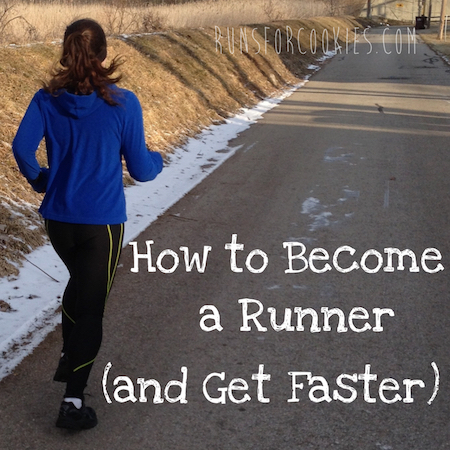 I just wanted to share that I LOVE following your blog and b/c of you I am attempting to become a runner. I'm also a WW member and you help keep me on track. I check in with you daily and it gives me inspiration to keep fighting towards my own personal goals. Quick question for you... 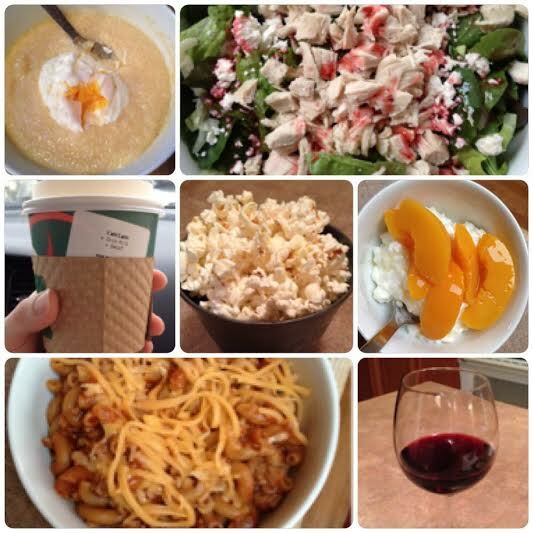 I love the photo groupings you've included in the last 2 posts when showing photos of your meals for the day. What program do you use to make the groupings? Is it available for everyone? I would love to try it out with my own photos. Any help would be appreciated. Thank you, Kelly! I use an app on my iPhone called InstaCollage. It's super easy to put pics together quickly, and it's free! Thank you so much. I will look for the app and give it a try. It must be surreal to still be questioning yourself and have hundreds of people hang on your every word at the same time. So, let me say that even if you don't think you've done a terrific job of maintenance, you've done an AMAZING job of turning hundreds of people into weight-losing, running miracles! (Myself included -down 33 pounds since I started following you!) That's a HUGE success. Thank you, Laura! A half-marathon is DEFINITELY possible. 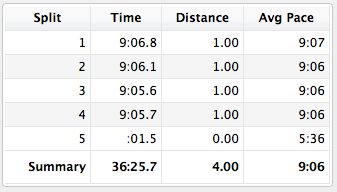 I never dreamed I'd run a 5K, let alone a half or full marathon. Good luck on your race this weekend! Hi Katie! Today is my first time commenting on your blog. I believe I've read through nearly 2 years of your posts, although I only started reading maybe 5 months ago. I want to share with you how much I look forward to reading your blog every. single. day. I have learned SO much from you in my short time reading. You have even inspired me to go on my own weight loss journey on Weight Watchers at 15 (don't worry, my parents are supporting me 100% :)). I have also struggled with some form of binge eating so I really enjoy that you share your struggles with us. 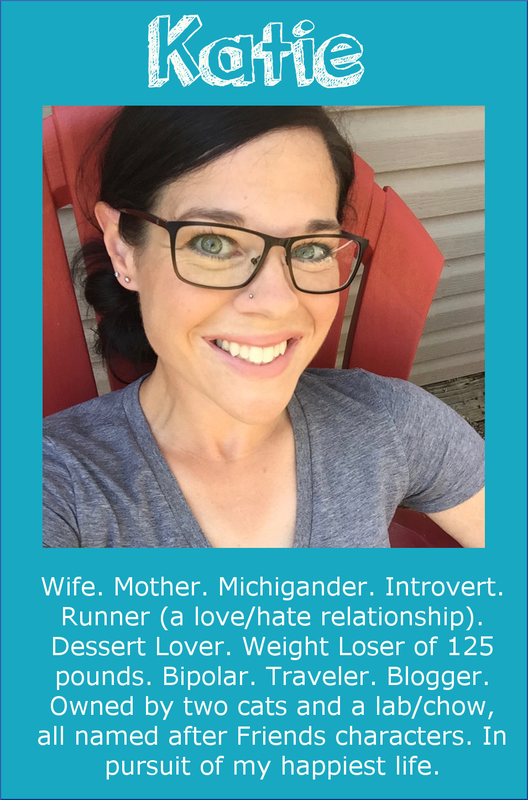 Since I have begun reading your blog, I have registered and ran my first 5K (last weekend!). Your continued genuineness and honesty keeps me coming back for more... so, thank YOU!!! What an accomplishment to have kept the weight off after all this time. Congratulations!!! We tried cats and tadpoles Our male cat became so obsessed by the tadpole cage that as soon as we left one day, he figured it was time to make his move. Bye-bye tadpole. Devastated, we tried again. We got two this time. Who knew that tadpoles will eat one another?!? The larger tadpole ( a male obviously) ate most of the little one (except for one leg floating around). But then straight up justice. Our cat ate the male tadpole. Those were some science lessons for my boys. We stuck with just cats after that. Good luck with the gerbils! 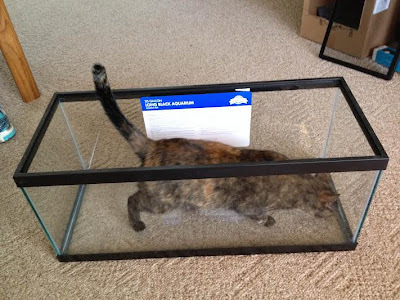 I had a guinea pig in a large aquarium and had a cat similar looking to your cat that used to jump in the tank and just sit at the opposite end of the tank staring at the poor guinea pig who would be squeaking in terror at this thing in it's space. We finally had to get a cover to keep the cat out. I think you need to give yourself credit! You've done an amazing job, and while you may not be exactly where you want to be, you are much closer than you were four or five years ago!! You'll get there again!! Katie I think you have done a tremendous job with your maintenance! I don't think it will ever be easy or that we can ever go on auto pilot especially when we have a food addiction or binge eating disorder. The plan you are on now is basically eating clean and that's what works for me. When I eat processed foods I get cravings really badly and then I overindulge or binge. I really do have to stay away from them as I have no tolerance. Your honesty with your struggles and your successes has inspired me and I'm sure thousand's of other folks that follow your blog. You are such a strong person and I am so proud that I know you. I am really looking forward to meeting you in person in April. Always remember what an amazing person you are!